we await Christ’s coming again. This is the night we gather around the new fire to light the new Easter Candle. This is the night we move into the darkened church with our candles lit, the night we sing songs of resurrection, the night we renew our baptismal vows and then share the Easter Eucharist with the risen Lord. (And we get to do it with the Anglicans!) I love this night. Do you see what Paul is saying here? Once baptised, we are baptised into Christ’s death. Don’t forget, ‘baptism’ really means to be immersed. It might not look like it our churches, but we go right under the water in baptism. We go down for the third time—in fact, Paul says “we have been buried with him by baptism into death”. Through baptism, we are dead and buried—to sin. We are dead and buried—to the old ways of living. That’s what happened when we were baptised, even if we were baptised as infants. We have been buried with Christ. That’s done. Now, we are to “walk in newness of life”. But it’s not automatic. It’s not you are buried with Christ and you ‘automatically’ walk in newness of life, but you are buried with Christ so that you may walk in newness of life. Once we realise who we are—people buried with Christ, dead to the old ways of the world—we can start to reorientate ourselves. We can start to live as part of the new creation that the Resurrection of Jesus has brought into being. Yes, we fail, that’s why we need nights like tonight. A night in which we reaffirm our baptismal vows; in which we together proclaim the Faith of the Church in the words of the Apostles’ Creed; and in which we remind ourselves that we are marked with the sign of the cross. And where here, at least, we do it ecumenically. …if we have been united with him in a death like his, we will certainly be united with him in a resurrection like his…if we have died with Christ, we believe that we will also live with him. We walk in faith, we live by hope. We have been untied with Christ, one day we shall be like him. Baptism isn’t automatic, but it is grace. God redeems us; God sanctifies us; God will transform us so that one day, we may be his children in every fibre of our being. What can we say? Thanks be to God! Alleluia! 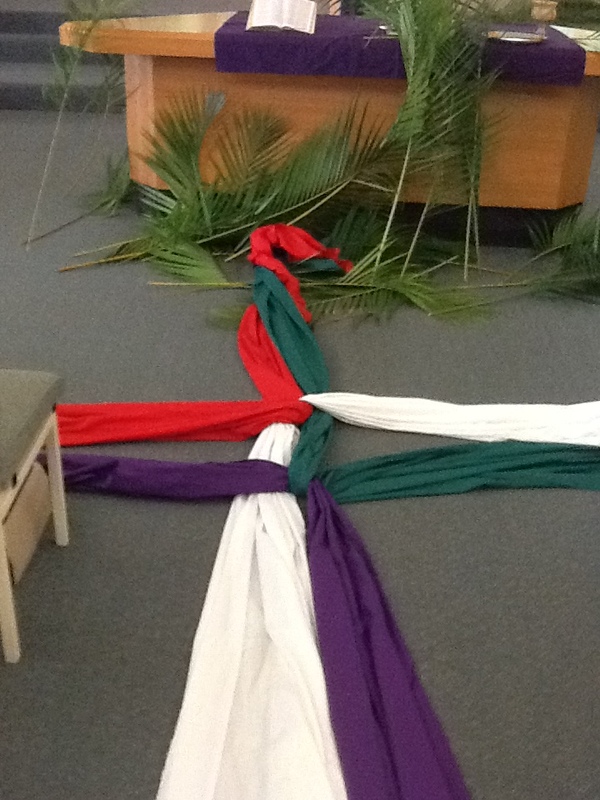 Palm Sunday this morning at Centenary Uniting Church. Thanks Josie! 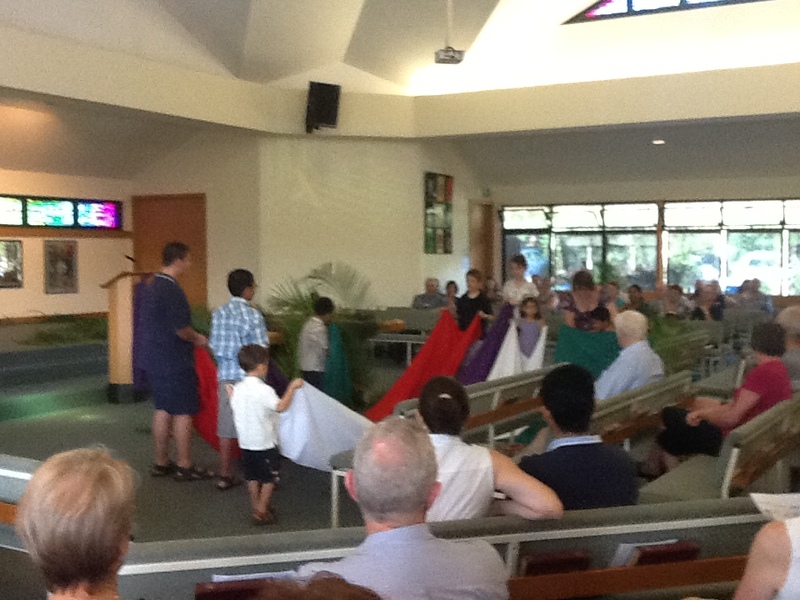 We heard one of the best-known of Jesus’ parables today, the Parable of the Prodigal Son. So is it about a spendthrift son, or a lost son? And what about the older brother, who is lost in his own way? Is it the Parable of the Two Lost Sons? Or the Parable of the Elder Brother? Is it about the sons at all? Is it really about the father? Some have called it the Parable of the Forgiving Father; that’s a really good name, because where would we be if the father didn’t forgive his son? There are other names, like the Parable of the Waiting Father (Helmut Thielicke) or the Parable of the Father’s Love (Joachim Jeremias). These names highlight different aspects of the parable, don’t they? The father waits daily for his son’s return; the father’s love is the thread that runs through the whole parable. The name we give to the parable influences what we see when we look at the parable. Let me share my favourite name for this parable: the Parable of the Powerless Almighty Father (Eduard Schweizer). We know about the Parable of the Prodigal Son. So let’s talk about the Parable of the Powerless Almighty Father—you may be less familiar with this version. Hearing the parable this way raises questions for us: Is the Father almighty? Is the Father powerless? A tension has already been set up. Two sons means conflict. It’s been that way from the beginning. Cain and Abel, Jacob and Esau are only the merest tip of the iceberg. The Father is approached by the younger son, who basically tells his dad he’d rather his dad was dead. He wants his inheritance. Now. What can the Father do? How about say No? An almighty Father has the authority to refuse to give the son anything, while he’s still alive. And who would blame him? No one—the son’s behaviour is unforgivable. But the Father says Yes, and gives the son his inheritance. He is powerless to stop his son. Once the son has gone, the Father looks out for . He stands at the door, he walks down the road, he waits by the gate, he scans the horizon for any sign of his son’s return. Day after day, there is nothing, but still he persists. He is powerless to make the son come back. What if there were such a thing as a free lunch? We’re used to hearing There’s no such thing as a free lunch. But what if there were? In our reading from Isaiah today, he sounds like a bloke in a market stall touting for business. But instead of Fresh fruit over here! Come and get your lovely green apples, going cheap!, Isaiah is giving it away. Literally. Remember? How can he do it? How can he just give stuff away?